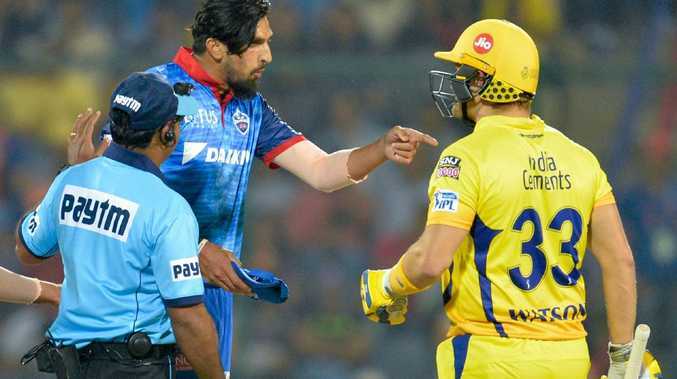 Indian star Ishant Sharma had to be pulled away by a teammate after a Shane Watson sledge appeared to get under his skin during a heated mid-pitch confrontation in the IPL. Watson produced a man-of-the-match display to help steer the Chennai Super Kings to a comfortable six-wicket victory over the Delhi Capitals - but it was his sledging masterclass that's overshadowed his batting fireworks. Sharma and South African star Kagiso Rabada were both on the receiving end of tongue lashings from Watson as the Aussie veteran turned the clock back in a masterful display with and without the bat in hand. The 37-year-old struck 44 off 26 balls in a dazzling 38-minute knock to lay the foundations of a successful Super Kings run chase as the defending champions bagged their second win from two in this year's competition. He was clearly feeling in the zone and he let the unfortunate bowlers on the receiving end of his pyrotechnics know about it. It started early in the second over of Chennai's innings after Sharma appeared to celebrate animatedly after capturing the first wicket of the innings. A moment later he was charging up to Watson with steam coming out of his ears after the Australian appeared to say something to him. As Sharma walked straight at Watson, the former Australian test star continued to chirp away with a big grin on his face. Sharma was then pulled away by Shikhar Dhawan - who also had a smile on his face - clearly fuming about what Watson had to say. The Aussie all-rounder certainly appeared to find his own comments amusing. His good touch continued later in the innings when he also clashed with Rabada before umpire Marais Erasmus stepped in to call the South African away. Watson and Rabada almost touched shoulders when Watson was running down the pitch during a Rabada over - and then continued to exchange words that left both of them with a grin on their faces. Opener Watson led the Chennai charge in reply to Delhi's 6-147 from their 20 overs at the Feroz Shah Kotla ground, striking four fours and three sixes as he kept his side moving along well ahead of the required run rate. Suresh Raina (30) and Kedar Jadhav (27) also chipped in before MS Dhoni's unbeaten 32, including two fours and a six, took the visitors over the line on 4-150.